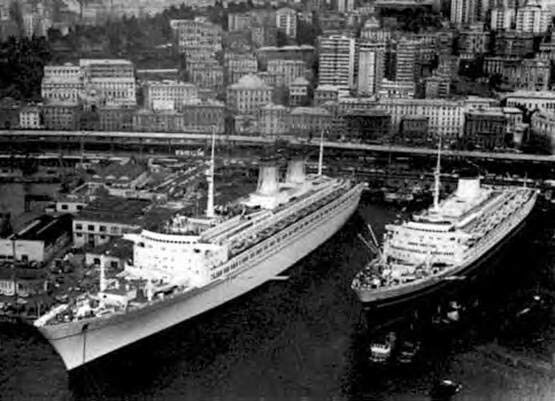 The 53,329-ton United States entered service for the United States Line in 1952 and the French lines 66,348 ton France entered service in 1962. In response to these two liners, the Italia Line ordered Michelangelo and her sister ship Raffaello as replacements for their 33,340 ton Leonardo da Vinci and Cristoforo Colombo. Michelangelo entered service on the Genoa - New York run May 12th 1965. 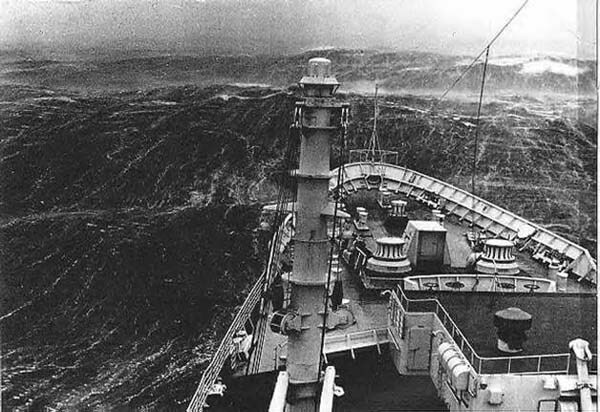 She was caught up in a severe storm on a crossing to New York April 12th 1966. The 50-foot waves created by that storm hit the ship with such a force they badly damaged her superstructure and swept two passengers overboard. Repairs to the damage had to be made in America before Michelangelo could be returned to the normally sunny route between Genoa and New York. By the 1970s, all the large liners operating on the Atlantic run were losing money due to the loss of passengers to the airlines. After a few years of government subsidies, it became obvious these liners could never be operated on the Atlantic run at a profit again. Michelangelo was subsequently taken out of service and laid up at Genoa in June 1975. Although a few cruise lines thought about converting her to a full time cruise ship, they considered Michelangelo to large for the cruise industry. The conversion of the French liner France to a cruise ship in 1979 showed that large cruise ships were the way of the future. This new era in cruising came too late for Michelangelo as the Sha of Iran had bought her in 1977 to serve as a military accommodation ship based at Bandar Abbas. After 14 years in Iran, she was towed to a scrap yard in Pakistan to be cut up.